Originally I was going to end this series at this point, because it is again June, and a year is long enough to study ice melting and refreezing, unless you get paid for doing so. However it looks like the Alarmists who were talking about the Arctic Sea’s ice being in a “death spiral” are about to be embarrassed. I don’t want to miss it, especially because I was called some rude words back in 2007, when I stated the lack of sea ice that summer was no big deal. The lower graph shows the amount of ice shrinking, as it does every summer, when the temperatures are above freezing for around two months. However the upper graph shows the shrinkage will be less than normal, and the amount of ice remaining at the minimum in September will be above normal. How can this be? 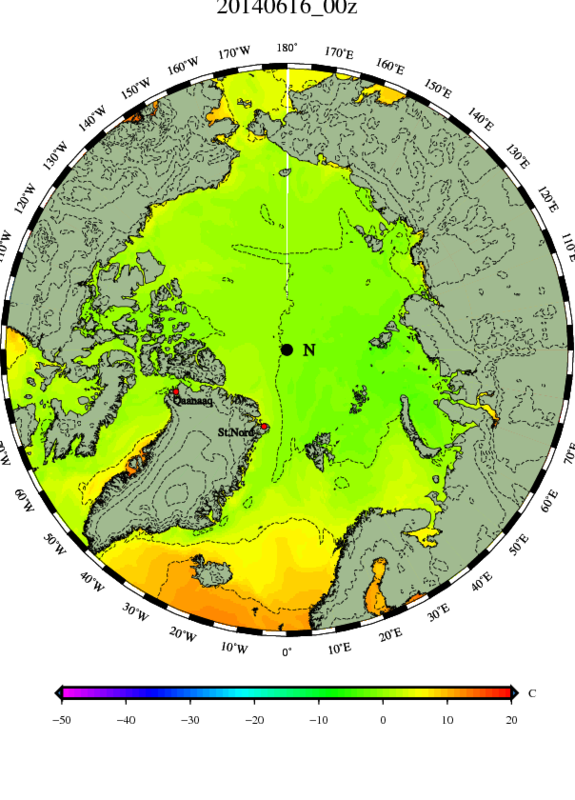 We were told that the North Pole would be ice-free by 2013, and instead we are seeing not merely the normal amount of ice, but even more ice than normal! The next DMI graph shows that polar temperatures are not rising as quickly as usual this spring, and the thaw isn’t starting on schedule. 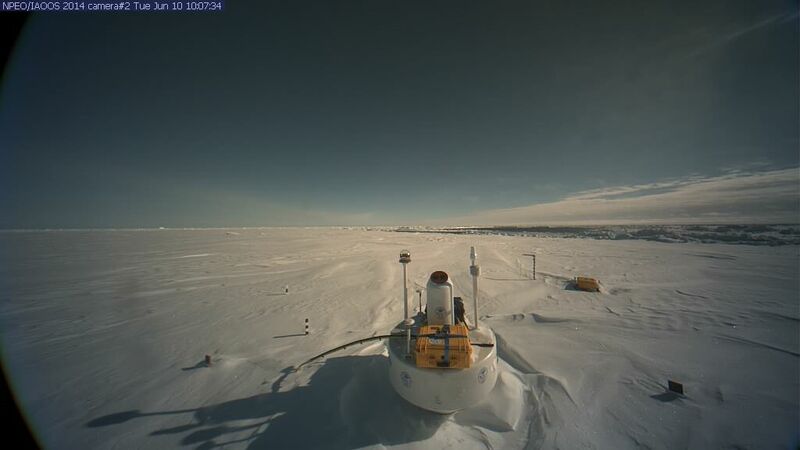 In this post I will continue to observe what is happening up there, and perhaps share some ideas I have about why it is not warming up there. 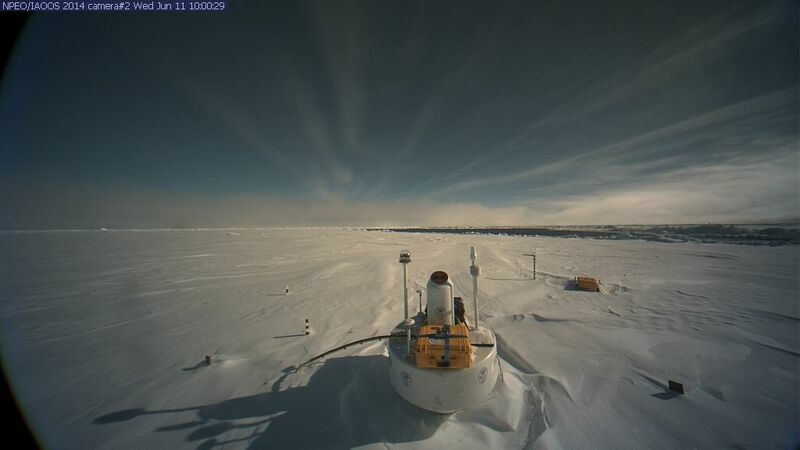 I’ll try to post maps of the conditions up there, and pictures from the North Pole Camera, twice a day. It is obvious that exposing open water, (during the ten months of the year when temperatures will cool the water more than the water would be cooled if it were sheltered under an igloo of ice), will create a cooler sea which makes for cooler air. It also forms more ice, but that ice is crunched together like an accordion, creating a formation called a “pressure ridge,” even as yet more open water appears as a long crack called a “lead.” Barring any influxes of warm water under the ice, open water is generally a sign of cooling. However the media is also cracked up and loopy, and any sign of open water makes them wild. If there is one thing I have learned, during the year I’ve spent simply observing the ice, it is that the media hasn’t done its homework. Many reporters do not even fact-check, and merely are parrots, while those who do glance north have only the most rudimentary understanding, and make the dumb mistakes I made when I first began studying, but never learn as I have learned. The media does make an effort to hide its mistakes, and even misinforms the public, for its mistakes are blazing headlines, while the corrections are in small print on page forty-seven, when they correct themselves at all. A fine example of this was the hoopla made about a melt-water pool that appeared in front of the North Pole Camera last summer, that some called “Lake North Pole.” Such pools become common at the Pole, after temperatures have been above freezing during the 24-hour-a-day sunshine for weeks on end, however the media produced a great deal of hype about “Lake North Pole,” insisting it was proof the Pole was melting. I said it was a pool, and would eventually drain away through a crack in the ice. That was what happened, but the media never showed pictures of the bare ice, and the fresh covering of snow that covered that ice within 72 hours. Therefore the media was guilty of a sin of omission, showing the public a picture of water at the Pole, but never showing follow-up pictures. 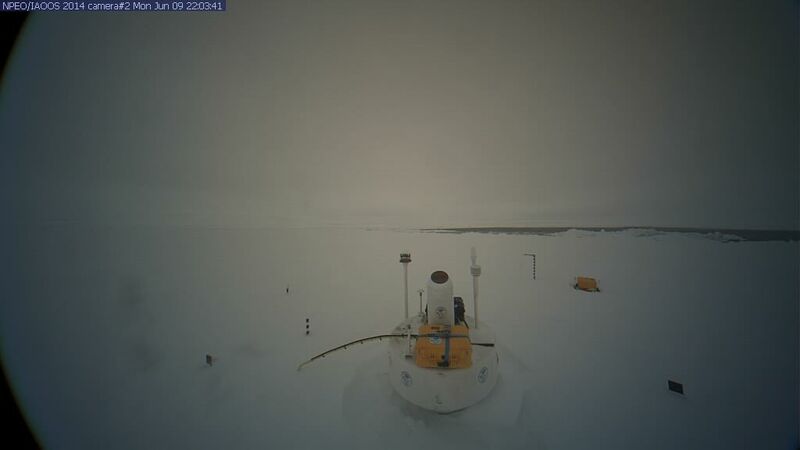 This year we have the experience of a “lead” opening up dangerously close to the North Pole Camera. 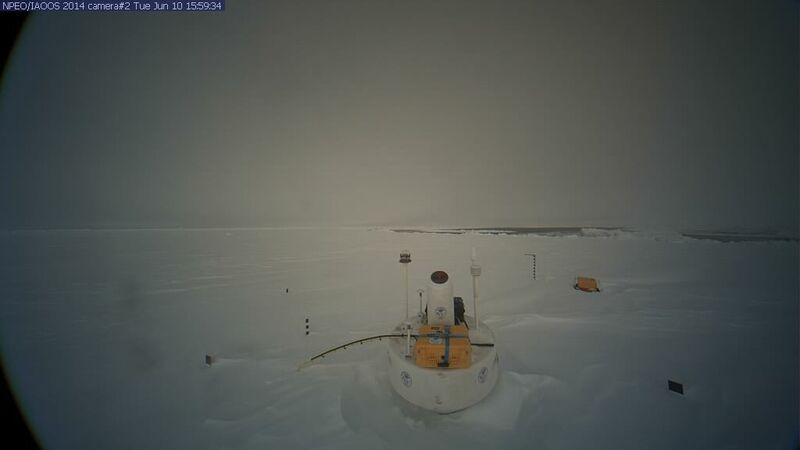 I fear we may eventually lose the camera, but so far we have experienced a wonderful view of the crack opening and exposing water, which skims with ice and then slams closed, showing us the jumble of a pressure ridge. My warning to you is that you are liable to see pictures of the open water, and the media will “forget” to mention, or show pictures of, the pressure ridges. Of course, this will be a moot point if the coming storm drowns our camera. We will have to wait until they post data at noon tomorrow to see what the temperature is. 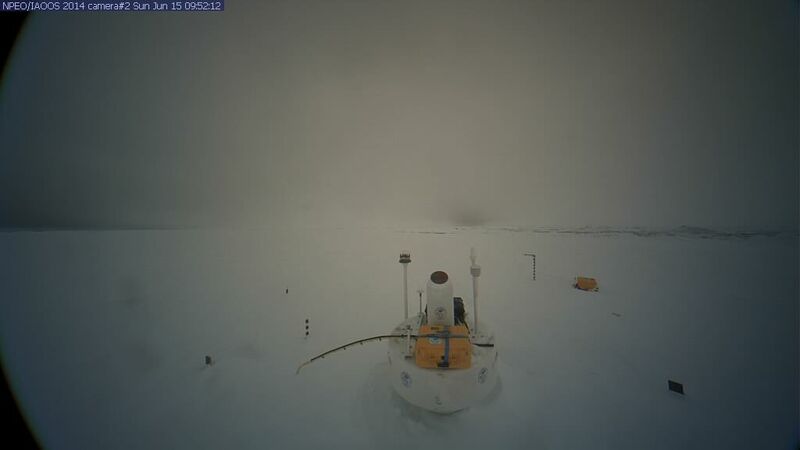 It is quite cold to our north, -6.74 C at Buoy 2014E: a hundred miles north, but to our west, just north of Greenland at Buoy 2014D: it is a relatively mild -0.50 C, which is closer to normal. After all, ordinarily the summer thaw has started by now. These pictures are from 4:00 AM (left) and 10:00 AM (right) this morning. The clouds are moving away and to the right, so my guess is winds are northwest. The camera data isn’t in yet, but my lunch break is over. 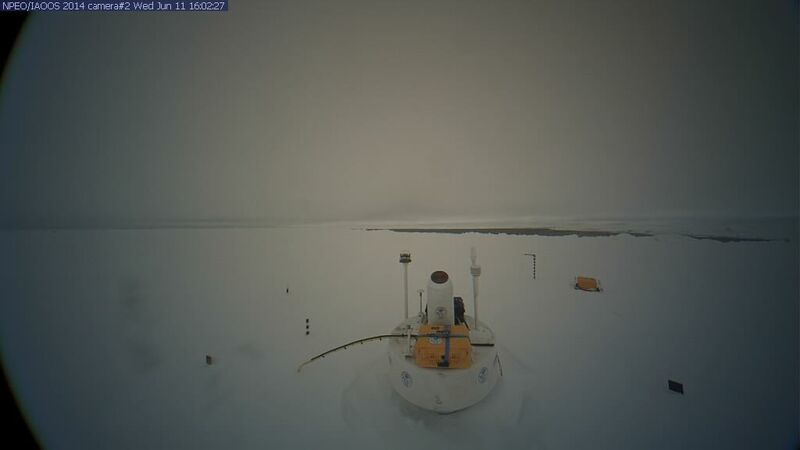 These pictures are from 4:00 PM (left) and 10:00 PM (right) and show the loss of distinct features that arctic adventures sometimes describe when weather gets gray. It is as if a sort of white-out occurs even without snow or fog, and they describe stumbling over bumps in the snow that they fail to see, due to the lack of shadows. In the first picture no motion is detectable in the distant ice, and in the second some of the small flows in the lead are drifting to the right. 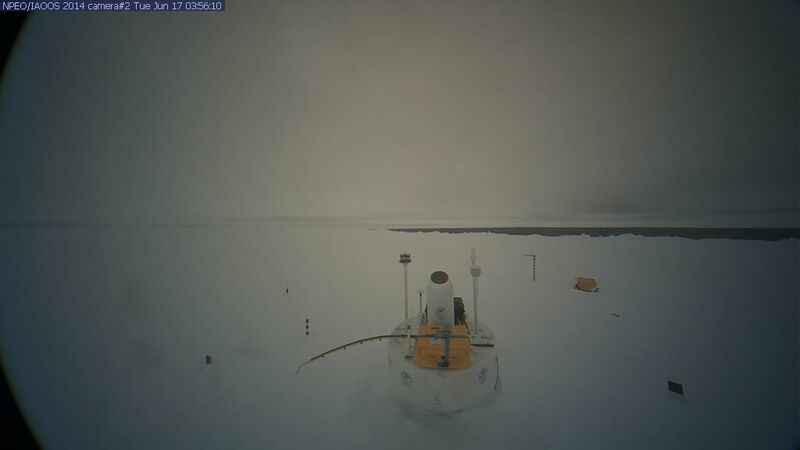 At Buoy 2014E:, north at 87.26 N, 10.91 E, temperatures have dropped from around -3.50°C to -5.29° C. Although a two degree drop might not seem like much, at times such slight variations seem to be associated with gloomy weather, and may be indicative of subtle arctic fronts. Perhaps colder air is curling south. The isobar map shows the storm I dubbed “Greeny” is weakening over the Pole, as “Lappy” starts to move north from the Laptev Sea. Lappy is the one which may cause a ruckus up there. The isotherm map is starting to look more like summer, over on the Pacific side. Remember that the average temperature is above freezing from now until August, but that doesn’t mean a few areas of below freezing temperature don’t drift about, especially south of the Arctic Circle where there is a brief arctic night (or twilight). Even north of the circle the sun can dip low at midnight, and create a slight diurnal variation as night swings around and around the Pole. (In in above maps midnight is at the bottom.) However the above map is still below normal, as there are very few pools of above-freezing temperature around the Pole itself. It is very warm in western Siberia, and Lappy is drawing some of that warmth north to serve as gasoline to fuel its development as it spins north. Although I like the simplicity of the DMI maps, I turn to Dr, Ryan Maue’s WeatherBELL maps to get a better idea of land temperatures around the arctic. This is the 0000z Canadian JEM “initial” run, from the same time as the above DMI maps. This map nicely shows the western Siberian late-afternoon warmth, cooling instantly as it is pulled north over the Arctic Sea. However that cooling only occurs at the surface, at 2 meters (six feet) and up even fifty feet the air remains mild (and likely more humid) longer. It is that warmer air that will fuel Lappy, and as it runs out Lappy will weaken. You can look at the same map in the GFS model, if you can stand the fact that, (likely due to politically-incorrect chauvinism,) they flip the map upside down so they are front and center at the bottom. You might think that, as these are both “intital” runs, and the same real data is plugged in, the maps would be the same, but if you have the time to blow examining the maps you can spot differences. This is due to the ways the models fill in the blank spaces between the actual weather stations. In a sense it isn’t that different from the old days, when two different weathermen might draw in the isobars and isotherms on maps, and arrive at different results. And, considering the models don’t even have the same starting points, you can see why they might arrive at utterly different solutions in the maps they produce of future conditions. In any case, the maps show the “gasoline” sucked north to fuel the possible storm. Now we have only to sit back and watch, to see if the storm actually develops. I’ve heard these patches of clear sky referred to as “weather holes” by people up in the north, which likely is due to having to fly everywhere, and being able to see well enough to land. The clouds are moving away and to the right, as the large berg at the right margin is shifting to the left, perhaps closing up the lead in the center distance. In order to grasp how fractured the ice is up there, on clear days I like to look down from outer space via a satellite. Using Google maps you can move a little hand around the screen, and in the lower left you’ll see the latitude and longitude the little hand is covering. Here’s a link to a permalink I (hopefully) captured yesterday. I recomend opening the two pictures above on separate tabs, and then clicking between the two. They are from 10:00 AM and 10:05 AM this morning. 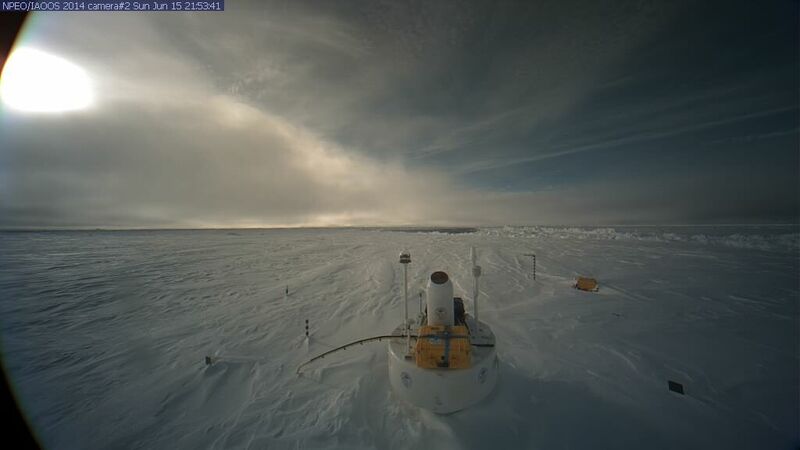 Besides the high clouds moving against the low, polar stratosphere, there is a bit of activity on the edge of the lead towards the middle right margin. The ice in or across the lead is edging right to left, (and perhaps shrinking the area of open water dead ahead,) and also it looks like the remnant of a pressure ridge on our side of the lead slumps down slightly into the water, hinting there is open water hidden from view there. 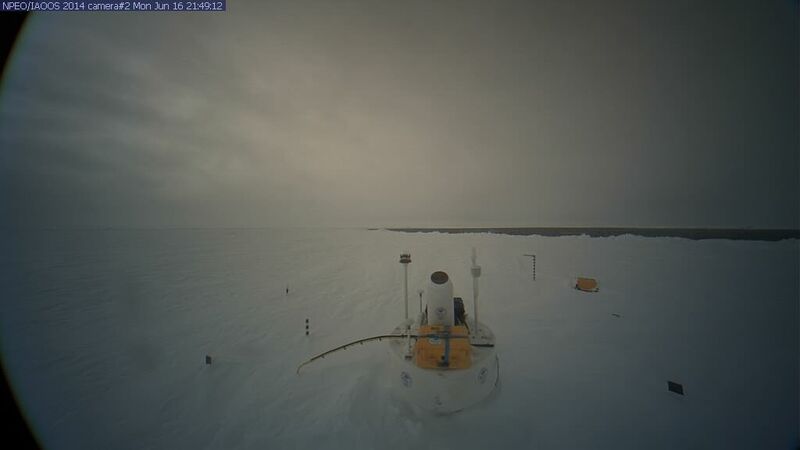 Also very nice is, above the pressure ridge on the far side of the lead, one can see the distant horizon, and a stretch of flat, white ice stretching off to what may be yet another pressure ridge, on the very fringe of the horizon. I sure do enjoy these moments of excellent visibility. There haven’t been all that many, this spring. The winds have apparently swing back towards the north, for the brief .002° northward blip at the end of yesterday’s record was purely a blip, and the southward and eastward motion resumed, bringing us to 85.515°N, 14.693°E at noon. Winds have been fairly steady, between 10 and 15 mph, and the barometer has only dropped slightly to 1011.6mb. 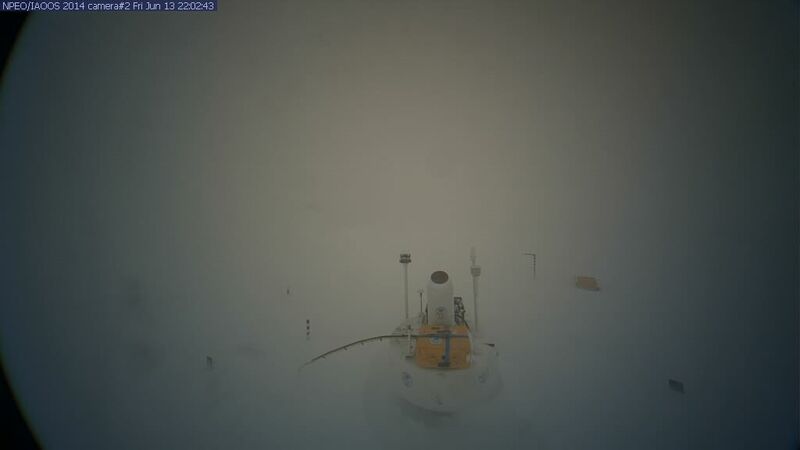 Temperatures trended down to -4.0°C at midnight, and then bounced about, up to -3.0°C at 3:00 AM, down to -5.0°C at 6:00 AM, up to -3.3°C at 9:00 AM, and down to -4.7°C at noon. It should be noted that none of these bounces gets us above the freezing point of salt water, which is one heck of a way to run a thaw. “Lappy” is starting his cross polar swing, but the warm air fueling him hasn’t made much of a dent in the below normal temperatures over the Pole. It is fairly hard to start a thaw with temperatures down around -3. Just as we had a slow start to spring down here, they’re having a slow start to thawing up there, this spring. 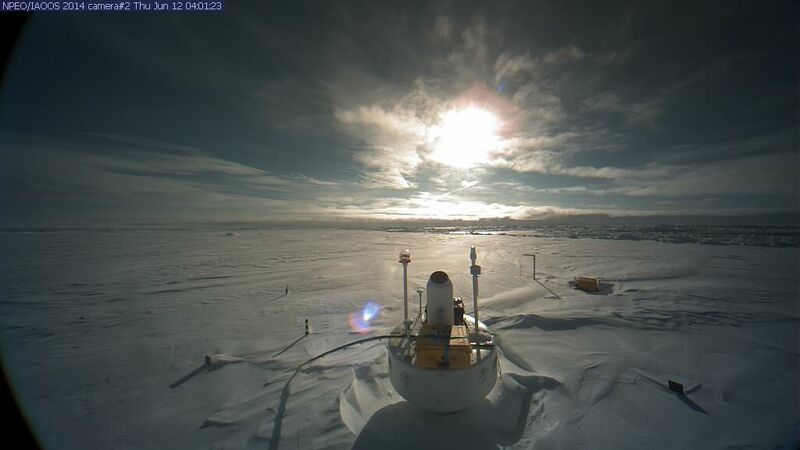 It sure must be hard for the crowd focused on “albedo” to have the sun popping in and out like this. One moment you are basing calculations on open water absorbing sunlight, and the next there is no sunlight. At the moment there is no motion visible when I compare pictures, so I suppose we are wedged up against the far side of the lead. It looks a little warmer, as no skim of ice seems to be forming on the open water. Although there is no island of sub-minus-five isotherms on the above DMI map, I was surprised to see a reading of -7.07° C at Buoy 2012G: , north of the Canadian archipelago, and a reading of -8.46° C at Buoy 2014B: , north of Alaska. It has occurred to me that all winter the cross-polar-flow was piling up the ice north of Greenland and the Canadian archipelago, and now that heap of slabs is being dispersed by the east winds into the waters north of Svalbard; waters that were surprisingly ice-free last winter. 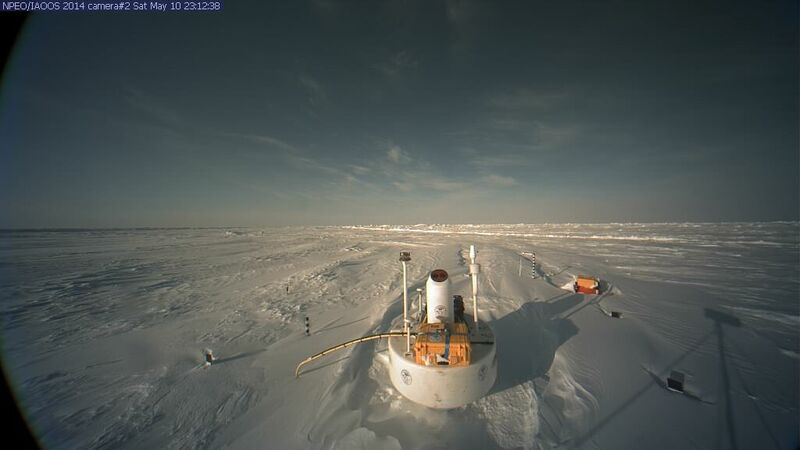 (Those who followed this post back in April may remember the arctic adventurers exclaiming over the size of the pressure ridges close to Canada, and posting pictures of ridges that dwarfed a six-foot-tall man.) If you think of those ridges as reservoirs of slabs, quite a flood of those slabs is capable of coming out of hiding, north of Greenland, and if they don’t head south through Fram Strait, and instead ride across the strait to the waters north and northeast of Svalbard, we could see areas of Barents Sea have a greater extent on the first day of summer than they had in the dead of winter. A quick look at Dr. Ryan Maue’s WeatherBELL map of the situation 24 hours from now (GEM model) raises my left eyebrow a bit. What is fascinating to me is the strong winds upwind of our camera. The red stripe is 40 mph winds, that decrease to green 20 mph winds, and finally blue 10 mph winds. The stronger winds will move the sea-ice faster. Think of it in terms of cars on a freeway. You have a bunch of fast cars stepping on the gas, catching up to a bunch of slower cars, (and remember sea-ice has no brakes). Hmm. What do you suppose will happen? Stay tuned!!! The open water dead ahead appears to be partially skimmed by ice. 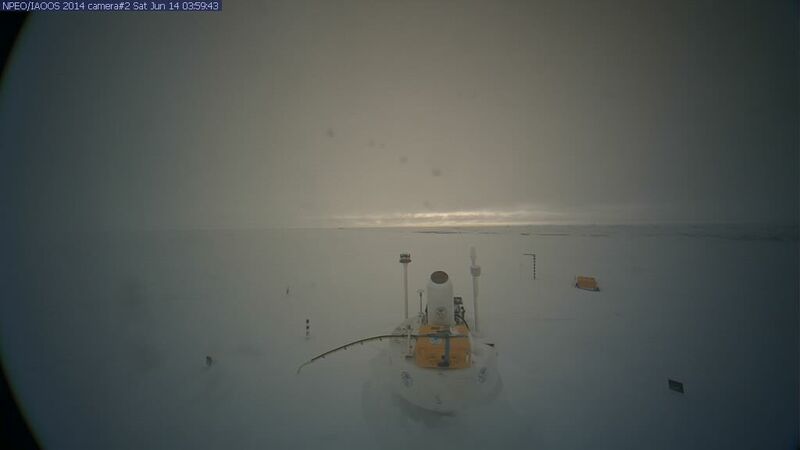 The ice across the lead is shifting to the right, perhaps due to northwest winds from our left, or perhaps the berg our camera sits upon is plowing ahead, shoving the ice aside. There is cold air to our north, -6.34 C at Buoy 2014E: , but behind our backs (north of Greenland) some much milder air is available, and it is -0.36 C at Buoy 2014D:. 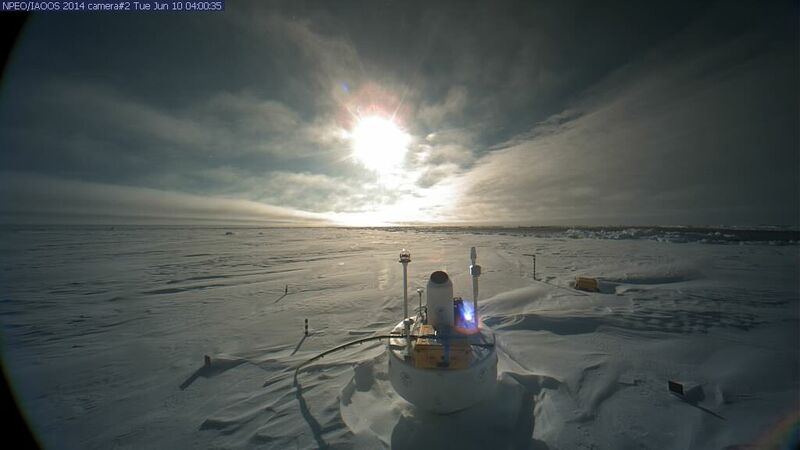 Also it has warmed in the broad daylight of noon north of the Canadian archipelago and Alaska, up to -2.14 C at Buoy 2012G: and up to -3.43 C at Buoy 2014B: . 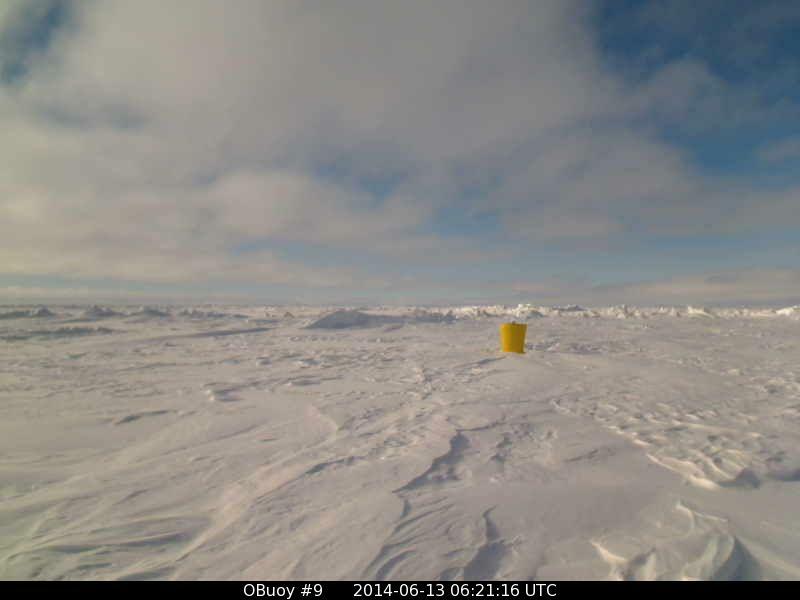 “Lappy” is approaching Pole and strong winds are starting to influence our camera. It looks like some above-freezing air is trying to work north from the southwest. (Click pictures to enlarge) They are from 10:00 AM (left) and 4:00 PM (right). Apparently it is crunch time, and there is no longer any sign of open water ahead. I’m wondering if we’ll see some big pressure ridges form. 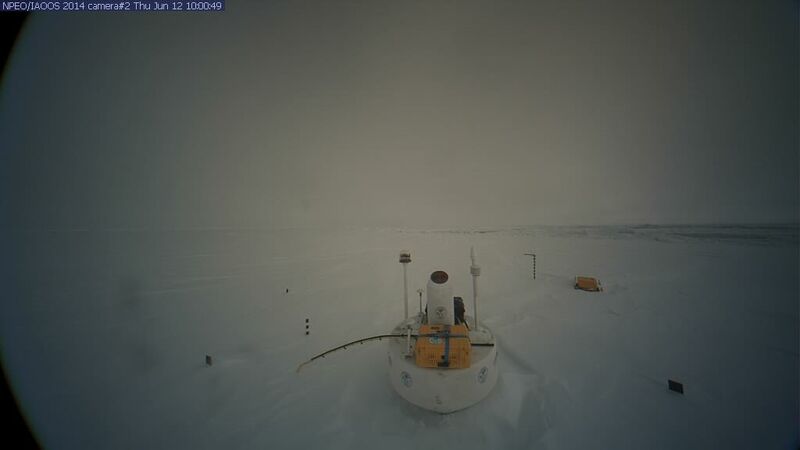 Our southward drift continued, and our eastward movement was steady and across 15° longitude for the first time, ending up at 85.431°N, 15.184°E at noon. The breeze gradually strengthened to a steady 20 mph. Pressures slowly fell to 1007.5 mb, as temperatures remains below the freezing point of salt water, rising to -4.2°C at midnight, falling back to the day’s low of -5.3°C at 6:00 AM, and rising again to the day’s high of -3.0°C at noon. “Lappy” is passing over the Pole and curving towards Scandinavia. It seems likely to pass northeast of our camera. At this point it is cut off from it’s original source of “gasoline,” and though the isotherm map shows some mild air being drawn in from north of Canada that warmth is largely due to noontime heating, and Lappy is likely to weaken. As a weakened Lappy digs into Scandinavia it seems likely to scoop up a low from the Baltic, and some models show that storm again heading right for the Pole, with surprising strength, next week. Usually things are pretty quiet up there in the summer, which is why summer storms make news. The storm in the summer of 2012 made news because it stirred up warmer water from below, which increased the ice-melt. 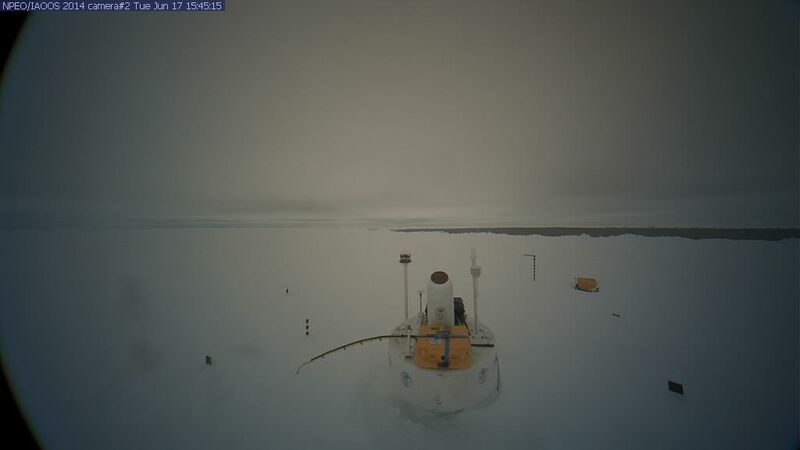 My pet theory is that the warmer layer of water that was stratified beneath the ice is “used up,” or at least doesn’t exist to the same extent, so current storms do not have the same power to melt ice. It is difficult to know if the fog is fog or very fine particles of snow. The snow stakes show no accumulation, and, if anything, show some slight signs the snow is being scoured away by the strong winds. The view has been gray all day, but the wind is gradually picking up, and now is steadily 25 mph. The pressure bottomed out at 992.9 mb at 6:00 AM and is now rising, at 998.0mb at noon. Temperature rose as the pressure fell, to -1.3°C at 3:00 AM, but then began falling as the pressures rose, to -4.1°C at noon. 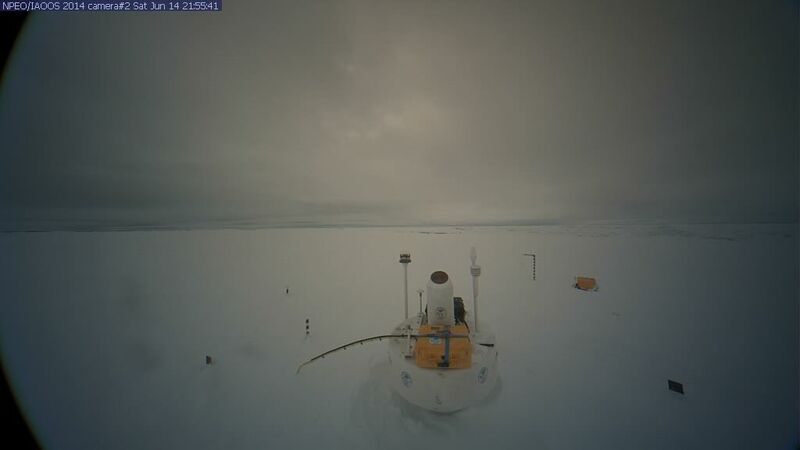 The camera made some impressive speed south and east, crossing 16 degrees longitude and getting as far east as 16.406°E before the wind must have veered into the northeast, and we shifted back west. (I wish I could see what this is doing to the ice.) Our position at noon was 85.327°N, 16.293°E. “Lappy” continues to move away from the Pole, and likely will start to weaken as it slides down towards Scandinavia. The blocking high continues to sit in the North Atlantic. Scandinavia looks likely to get northeast winds as Lappy nudges that high, and low pressure oozes up from the Baltic towards the Kara Sea. (If a storm develops there I’ll dub it “Carrot.”) “Lapeto” has developed as expected in the Laptev Sea. The isotherms are showing more above-freezing temperatures, especially towards Canada. Perhaps the thaw will finally begin. However I wonder if these polar storms have an over-all cooling effect. They transport a lit of heat and moisture up to the low polar stratosphere, where a lot of latent heat is lost as moisture condenses and then turns to snow. However then the air warms while descending. (While some summer thunderstorms generate a cooling effect, sometimes the uplifted air is quite hot when it comes back down, due to a sort of Chinook-effect.) I have no answer to my own question, and can only watch and witness. The above pictures are from 10:00 PM last night (top) and 4:00 AM this morning (bottom). (Click them for larger and clearer views.) It looks like there has been a little snow, though it could be frozen fog on the snow stakes. Our camera’s foundation didn’t crumble in the storm, and the pressure ridges on the right horizon don’t seem especially giant, though the lighting is poor. Our lead, straight ahead, is cracked open, likely by the shift in movement from eastward to westward, but the crack isn’t particularly wide at this point. It would be nice to get some better lighting. I’m already looking ahead to see if the Pole gets calm. 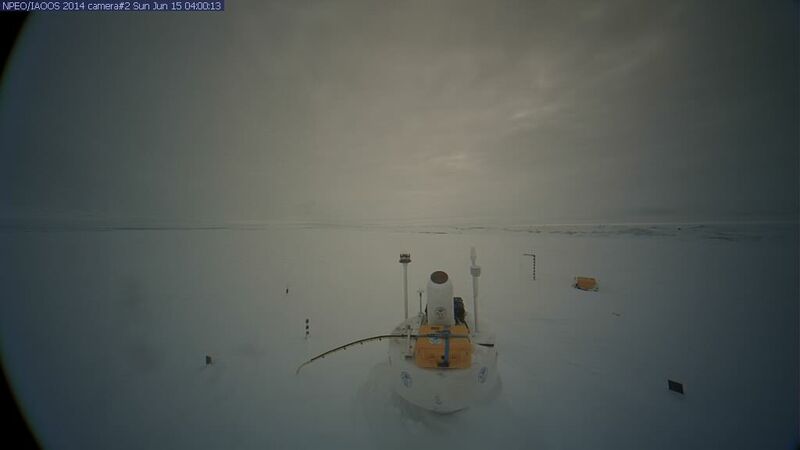 Over at the WeatherBELL site, Dr. Ryan Maue’s maps have the GEM model showing “Carrot” up over the Pole in only five days, even stronger than Lappy is. Hmm. No rest for the poor icebergs. Well, I guess we can infer it is warm aloft, and cold at the surface. Beyond that, all we can do is hope for warm sunshine to melt off the lens. It was stormy last night, with winds above 25 mph for hours around midnight, and the barometer falling again to 994.8 mb at midnight. Temperatures hit the day’s low of -4.5°C at 9:00 PM and then began rising to the day’s high of -2.1°C at 3:00 AM. After midnight the winds began slacking and the barometer rose, with the wind at 14 mph and the barometer at 1003.9 mb. Temperatures fell to -3.6°C at 9:00 AM but bounced back up to -2.8°C at noon, finishing another full day with temperatures below the freezing point of salt water. 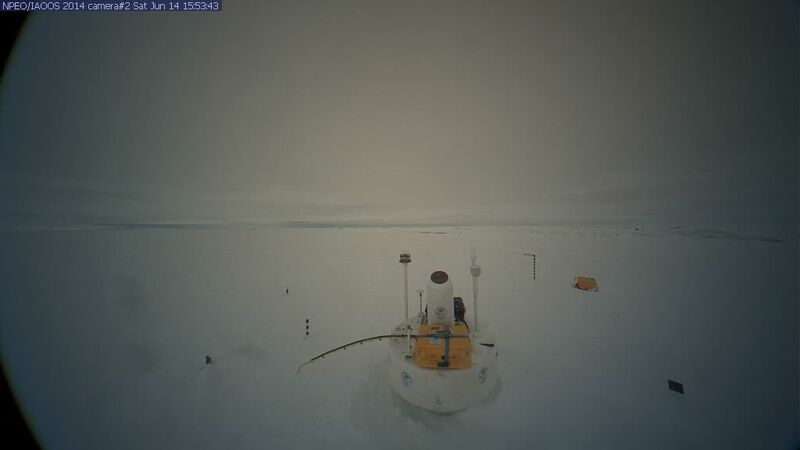 Our camera moved steadily south, but its westward movement was arrested by a lurch east for a while around midnight, before westward movement resumed, and we ended the day at 85.154°N, 15.555°E. I assume some sort of defroster was used, as the temperatures have remained below freezing in the area. In the fall we have to wait longer for a frozen lens to clear, perhaps because the sun is lower and the solar cells can’t be used for defrosting. 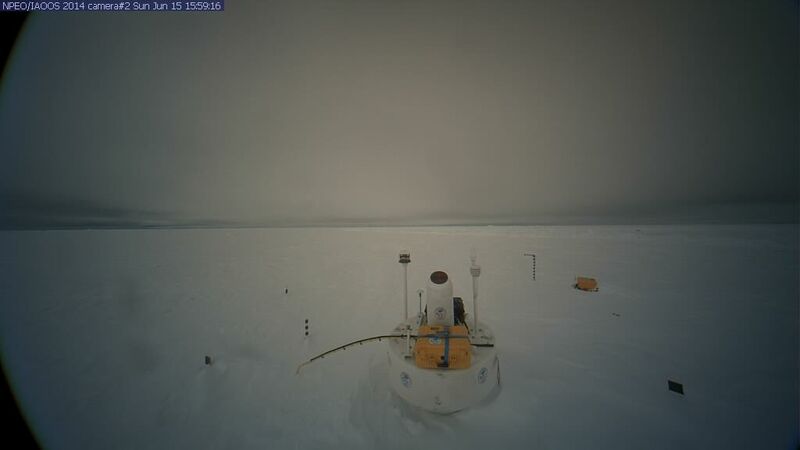 It looks like our nearby lead is slammed closed fairly tightly for the time being, but the dark clouds on the fringe of the horizon may indicate open water beneath. 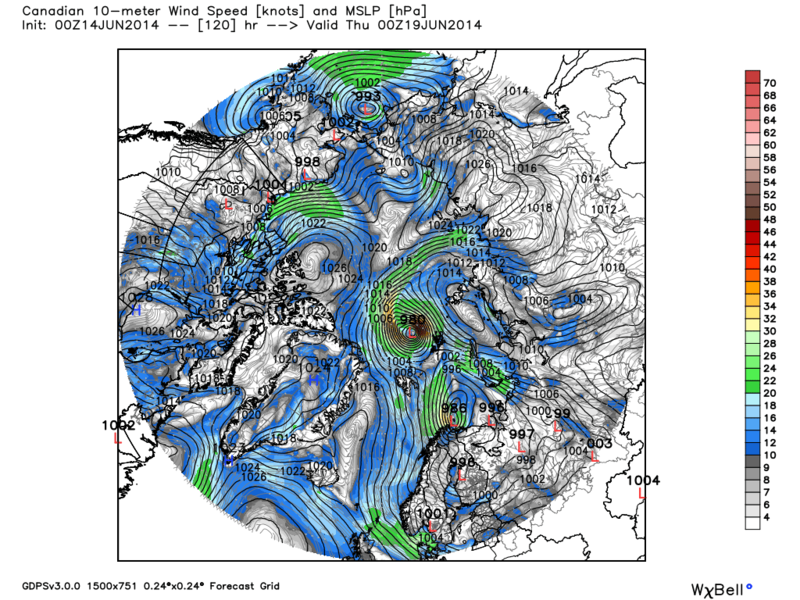 “Lappy” is heading down towards Svalbard and weakening slightly, (though not as swiftly as I expected.) “Lapeto” is leaving the Laptev Sea over the New Siberian Islands, and drawing mild air (and fuel) north over the East Siberian Sea. There is no sign of “Carrot” forming in the Kara Sea yet. 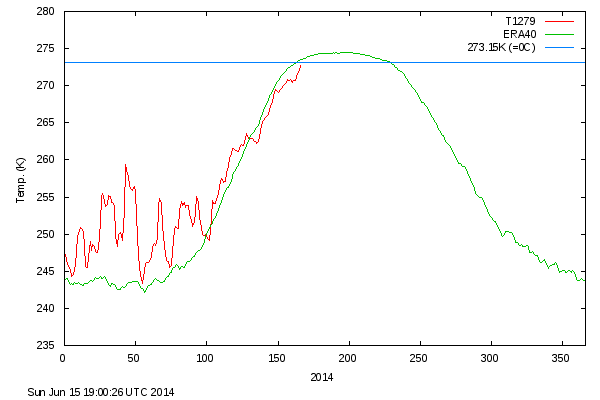 Temperatures remain below normal around the Pole, but are rising. “Lappy” is weakening as he completes his lap, moving back down towards Eurasia. A ridge of high pressure behind it will build north and between Lappy and Lapeto. As that ridge passes over our camera north winds will give way to calm, and then a period of south winds. Behind that ridge weak low pressure [“Elsie”, for Ellesmere Island in northern Canada] will move along the north coast of Greenland and add to the south winds, but this northward push of our ice looks like it will give way to a major southward surge, as “Carrot” moves towards the Pole next week. “Carrot” can be seen over Russia, between 50° and 60° at the lower right fringe of the circular map. 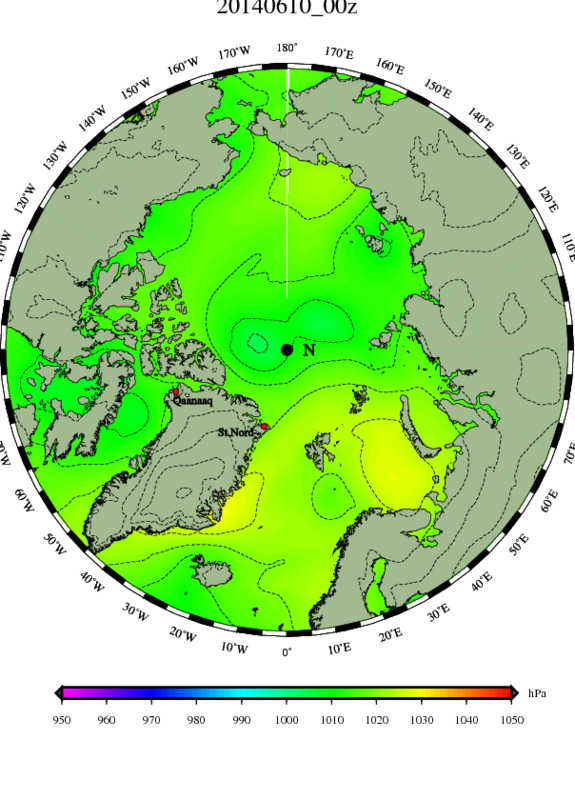 It looks like Scandinavia is in for an extended period of north winds. The ice across the lead appears to be moving parallel to the ice our camera is on, grinding against it. As “Lappy” fades in Barents Sea, the north winds behind it are giving way to calm as a ridge of high pressure extends north from the blocking high over the North Atlantic. While that blocking high has been keeping much warm Atlantic air from coming north, it does have a west side, pumping warmth north. When the blogger “stewart pid” today pointed out how warm the west side of Greenland was, we discussed a number of factors, but later it occurred to me that the blocking high may simply be pumping milder Atlantic air around that side of Greenland. In any case, an invasion of above-freezing air has wedged north on the Canadian side of the Pole, and is clearly seen on the temperature map. Perhaps the thaw will at long last begin, as the DMI temperature graph shows we are finally close to the freezing point. Though the view remains gray the winds have slackened to 5 mph. The ice across the lead has come to a halt. Things are quieter, for the time being. Our camera survived another storm. 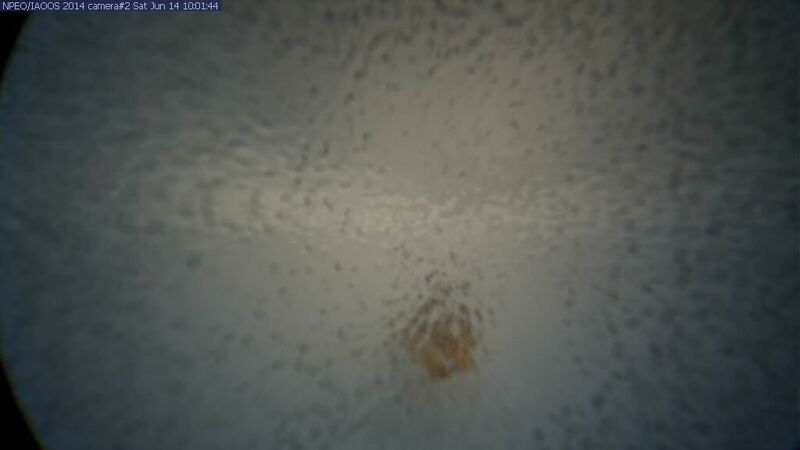 The barometer has risen rapidly to 1015.3 mb at noon, and I’m hoping we might get some sunshine soon. Then again we might not, as it is warming and that often brings clouds. Temperaturs have bounced around, but mostly have been above the freezing point of salt water. Our high was -0.9°C at 9:00 last night, and is has settled back to -1.7°C at noon. Our movement has been slower, but steadily south and west, winding us up at 85.092°N, 14.554°E at noon. The first picture is from 10:00 PM last night, and the second (lower) picture is from 4:00 AM this morning. Notice how only half of the volume of the pressure ridge stays on our side of the lead, while the other half has gone sailing off. “Lappy” is fading into “Carrot,” now just emerging into the Kara Sea. “Lapeto” has a trailer now, “Lapedoto,” and together they are going to exit through the Bering Strait. Weak low “Elsie” now is north of Greenland and heading for our camera, giving us south winds. 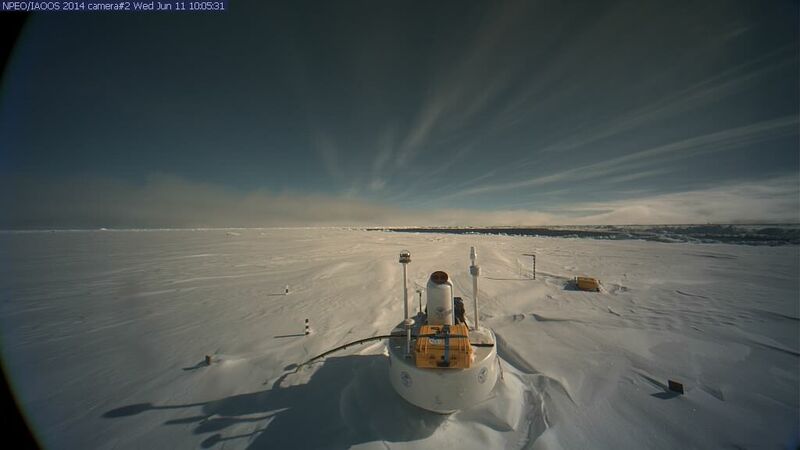 Winds shifted and the camera is headed back northeast, at 85.134°N,15.234°E at noon. Barometer is falling, down to 1007.4 mb. Temperature hit its low at midnight at -3.1°C, and its high of -1.5°C at 9:00 AM, and had dropped to -2.2°C by noon. 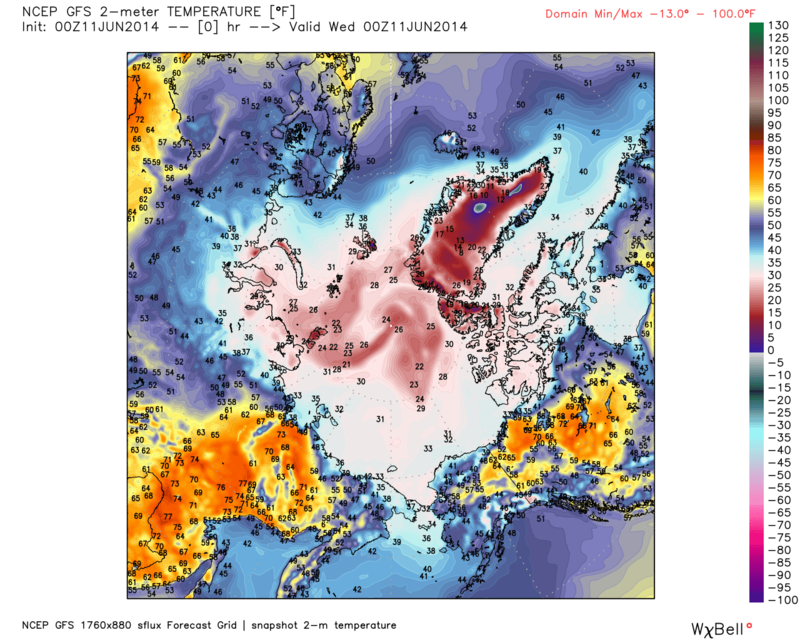 The thaw has finally begun, on the Canadian side, as the sub-freezing cold continues on the Eurasian side. 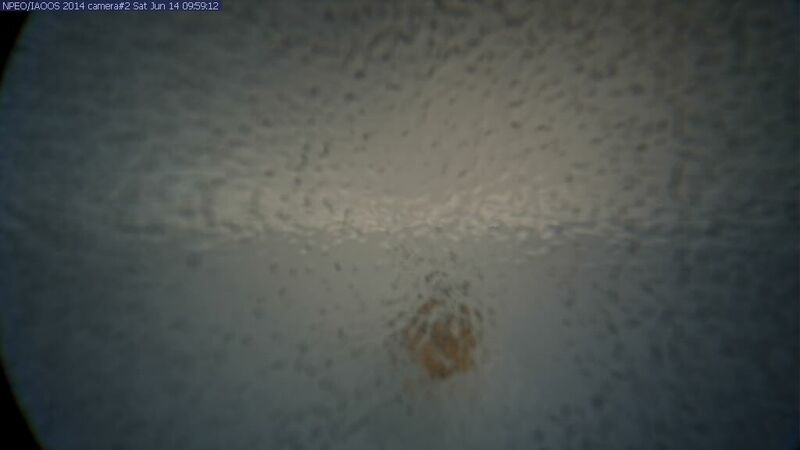 “Elsie:” is drifting over our camera, and the south winds will shift to the north behind it. “Carrot” is forming over the Kara Sea, but is no longer forecast to charge the Pole. 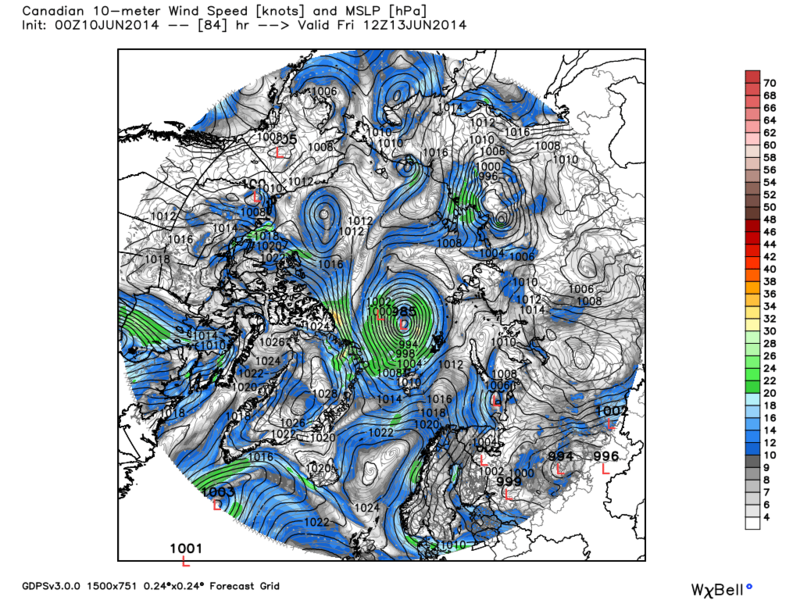 Models now show a storm-track along the coast of Siberia, with Carrot following Lapeto and Lapedoto. Sorry if I’m late posting maps. I’m engrossed with other writing. These pictures are from 10:00 PM yesterday (top) and 4:00 AM today, (bottom). The far side of the lead is slightly closer. The lead shows no sign of refreezing, but can’t absorb much sunshine if it remains cloudy. It would be interesting to know if the Pole has been significantly cloudier this spring. 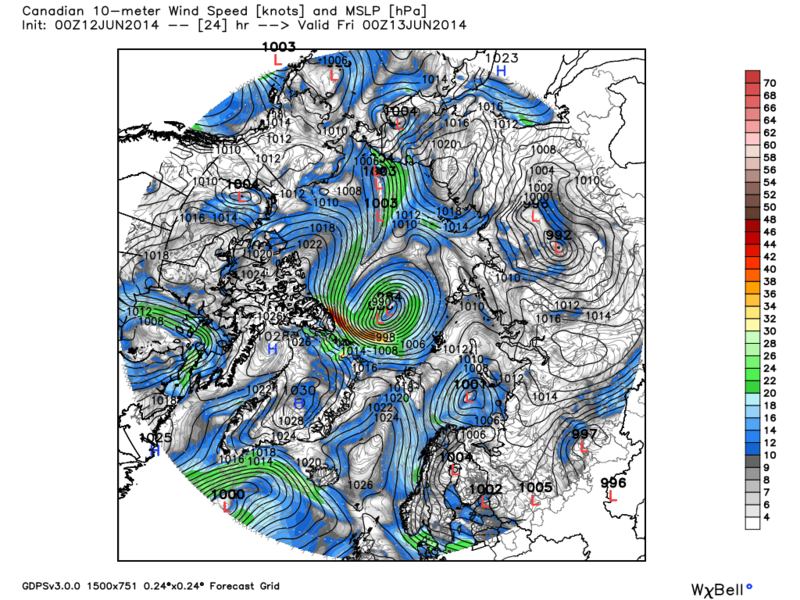 “Carrot” is the big boy on the block, swirling up in the Kara Sea as “Lapeto” weakens over by Bering Strait. “Elsie” is an interesting little low as it dives southeast into Norway, for it seems to be getting reinforsements from a practically invisible storm-track over the big high blocking the North Atlantic. These dive through the Baltic and then seem to stall and gather force just east of Finland. You can see a small storm sitting there now. You can’t see a tiny low being squeezed over the top of Iceland. These storms will all gather together east of Finland the next few days. I guess I’ll continue to call it “Elsie” although it is actually a conglomeration. There are also impulses coming north from the Steppes to join the fray. I doubt the computer models will handle it well; there is simply too much subtlety. These southerly winds lifted our temperatures up close to freezing, up to the high of -0.5°C at midnight, when the winds were up over 20 mph. Then the temperatures dipped slightly, back down to -1.1°C at noon. As this opposes diurnal variation (which is slight but does exists, now that we are nearly 300 miles south of the Pole,) I assume some slightly different air mass is involved. 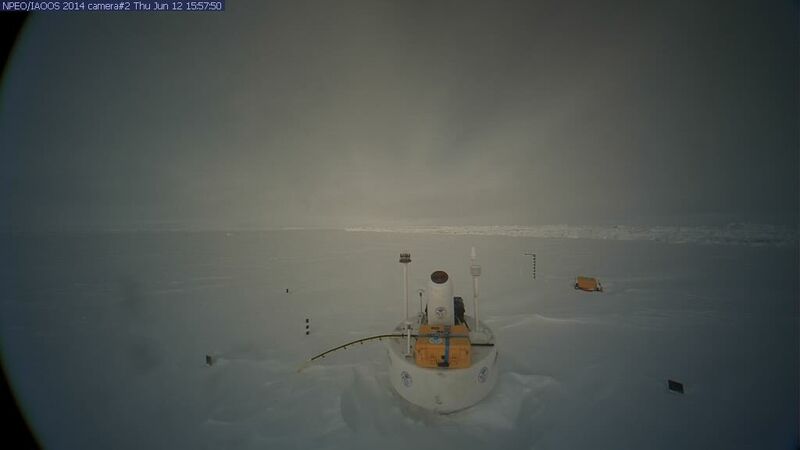 The winds did shift and stop our eastward movement at 15.401°E at 9:00 AM, and lurch us back west, but we’ve continued to move north, and at noon were at 85.260°N, 15.348°E. Pressures bottomed out at 1005.6mb at 9:00 PM last night as “Elsie” passed, and have risen back to 1015.2mb at noon. I was surprised Elsie, who had such a small blip in terms of pressure, had the winds she had. “Carrot,” over the Kara Sea, is drawing from some very warm air (up in the 80’s) in central Siberia, and the models keep flip-flopping over whether it will be drawn towards that warm air and track east along the coast, or whether it will copy prior storms and head for the Pole. Very cool air is being drawn south over Scandinavia by “Elsie,” which looks like it will stall and sit over Finland all week. The air swirling in Elsie is fairly dry so they may get some spells of sunshine, but any warmth will have to be home grown. A tiny low is rippling up over the top of the blocking Atlantic high, and is just east of Finland. The thaw is finally beginning at the Pole, so I think I’ll start a new post today. This entry was posted in Arctic Death Spiral, Arctic Sea Ice, Blogging, Cold Waves, Global Warming, Greenland, Meteorology, Sea Ice, The Sea, World Temperatures by Caleb. Bookmark the permalink. 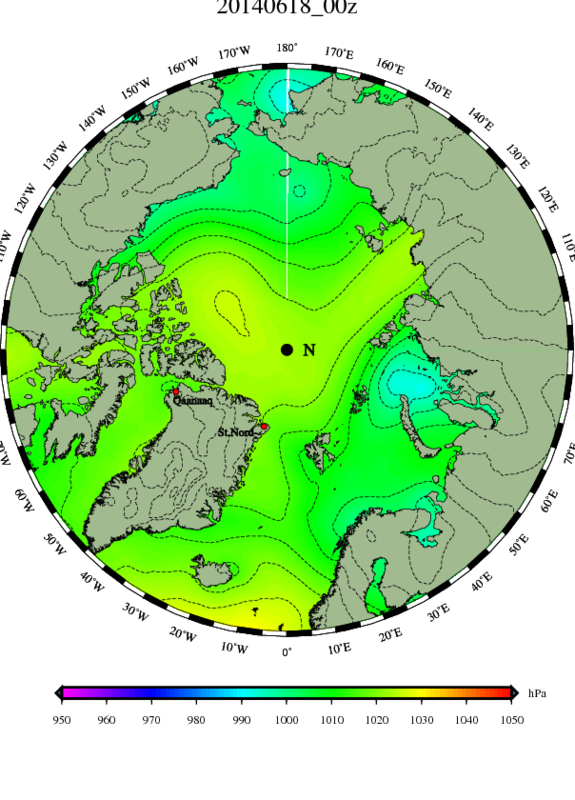 Caleb have u noticed the hot spot on the west coast of Greenland. When I saw I immediately thought “what is that doing there & how” …. 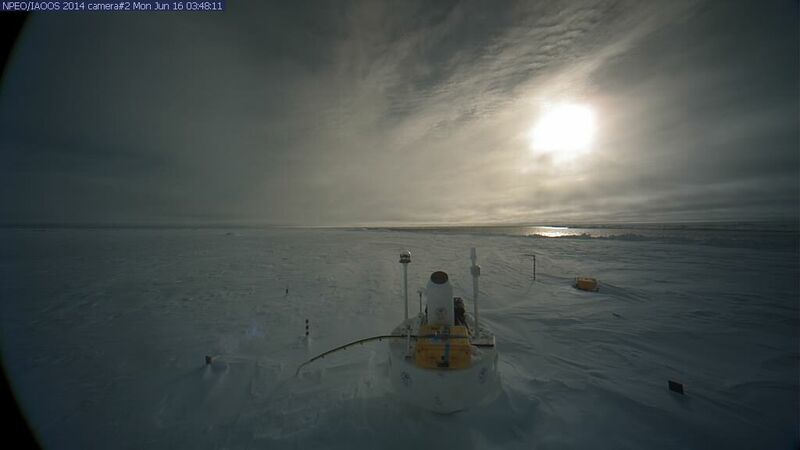 a bit of digging with winds and it looks like a Chinook flow off the ice cap summit / adiabatic warming … just a guess but it fits with the data. Surprising and interesting. No I hadn’t noticed it. Which map are you looking at? If it is up towards the top of Baffin Bay it might be due to open water up there. The wind comes screaming down and a polynya forms, when the ice gets blown away from shore and water upwells by the shore. I’ve seen open water up there in the dead of winter when it is -40 all around, but much warmer over the water. It could be adiabatic warming as well. That has got to happen when winds ride over that icecap. I’ve also been wondering if Chinooks happens in Finland, when moist winds from the Atlantic ride over the mountains of Norway and Sweden. 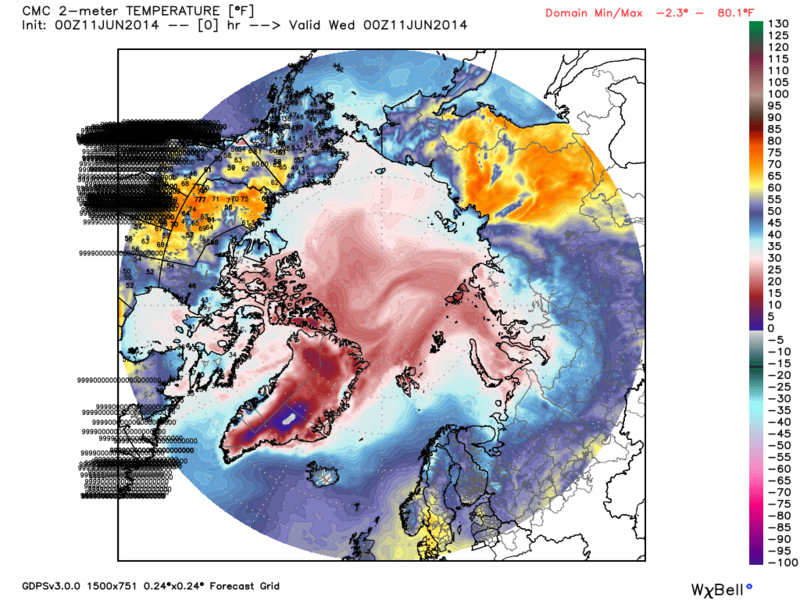 Actually, once you pointed it out, I noticed the warmth off the west coast of Greenland on the DMI map. It was right there, but my attention was focused on other things. That is why it is always better to have many eyes looking at a situation. 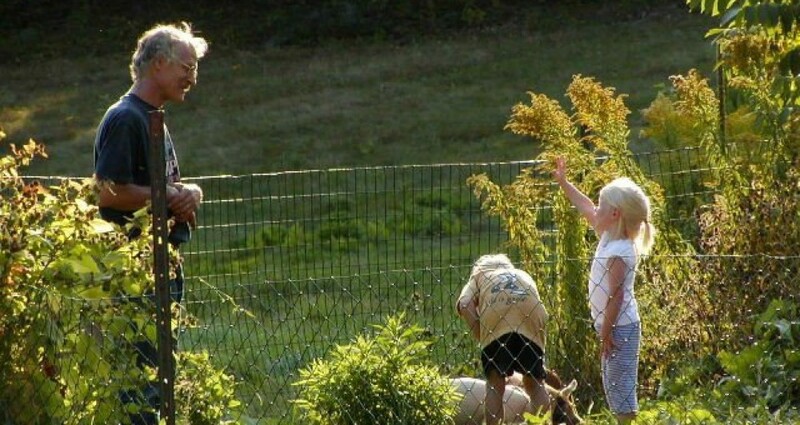 No one person can spot everything going on. That is EXACTLY why you have to stay with it. 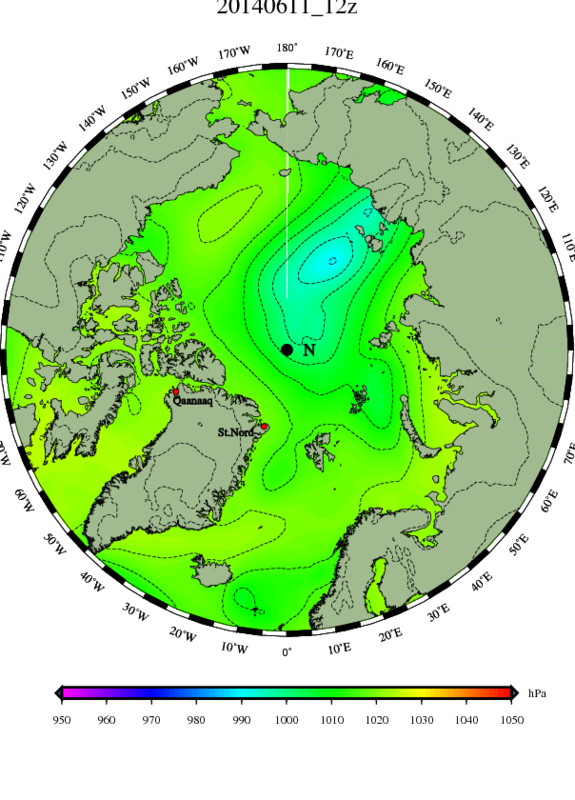 No one else presents the documentation, related to the Arctic sea ice, as you do. Thank you. You make me feel pretty special, and flattery is always nice, as long as my head doesn’t get too big to fit through the door. I think others must do what I do, especially the scientists. They likely write papers that display far more knowledge than I own. However scientists often didn’t do so well in English classes, and their writing can be difficult to read, or downright impossible, even for other scientists, but especially for laymen. Instead modern reporters seem to parrot press releases. Until recently I never imagined reporters could be like that. Who ever heard of a reporter who doesn’t ask any questions? One of the first questions I’d ask, if I were a reporter, is, “Who wrote this press release?” Often it is quite obviously not a scientist. All I am doing is seeking answers to the questions reporters aren’t asking.